Involving the use of high powered platen presses, Celsur’s die cutting services UK and paper die cutting services UK allow us to produce many varied products, using substrates as varied as Polypropylene, PVC, card, PU and Leather. The die cutting tools used in die cutting services and paper die cutting services, are usually produced using a wooden base with steel cutting rule embedded into the wood, using sawn or laser-cut grooves in the shape or design chosen. These tools are then mounted to the bed of the platen press and an impression is made (normally in a clear material) which allows the machine operator to correctly place the raw material into the correct position for cutting. Guides are then placed on the machine bed to ensure each sheet of raw material is die cut in the same position as the previous (a must for printed items), once the die cutting has taken place, the waste material is stripped from the perimeter, leaving the die cut product to continue its journey through the factory. 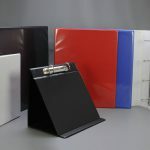 Ring binders, animal food scoops, document boxes and coasters are all examples of items that can be formed using the die cutting of sheet materials, and it can also be used to prepare raw materials such as PU and leather for the construction of folders and wallets for a high end high quality finish. Die cutting can also be used to pre-form board for PVC ring binders, allowing apertures etc to be included in the design of the folder. The presses involved in this type of die cutting services UK and paper die cutting services UK are extremely dangerous, so the highest level of health and safety procedures and devices are in action to ensure all operators using these machines can work effectively but safely.